We’d love your help. Let us know what’s wrong with this preview of Write! by Gerald DiPego. Write! is a breakthrough book from a successful professional author, for an audience of writers of all levels seeking a guide to the craft. DiPego’s unique personal approach takes readers on a private tour of his well-lighted rooms and dark corners, revealing his way of pulling feeling, experience and invention from within and weaving them into a story. The result of this Write! is a breakthrough book from a successful professional author, for an audience of writers of all levels seeking a guide to the craft. DiPego’s unique personal approach takes readers on a private tour of his well-lighted rooms and dark corners, revealing his way of pulling feeling, experience and invention from within and weaving them into a story. The result of this exciting method is the creation of rich, believable characters and an atmosphere of Emotional Realism. Write! shows that the inspiration for a new work is not reducible to rules, the mechanics of plotting, or finding a “hook,” but largely rests in the emotional journey of the characters, so readers are personally engaged and live the journey as they read. DiPego’s method is delivered on the page in a personal, conversational style, laced with examples from his published and produced work as well as relevant anecdotes from the life of a working writer. DiPego offers useful prompts and exercises to help writers integrate his method into their own work. DiPego is a veteran writer who has taught creative writing and screenwriting, spending four years on the faculty of the Santa Fe Screenwriter’s Conference. Write! distills wisdom from 45 years in his successful career as a writer of fiction in all forms, including novels (Cheevey, With a Vengeance, Keeper of the City and others) films (Sharky’s Machine, Phenomenon, Message in a Bottle, The Forgotten, Words & Pictures, and many more), short stories and stage plays. To ask other readers questions about Write!, please sign up. Be the first to ask a question about Write! 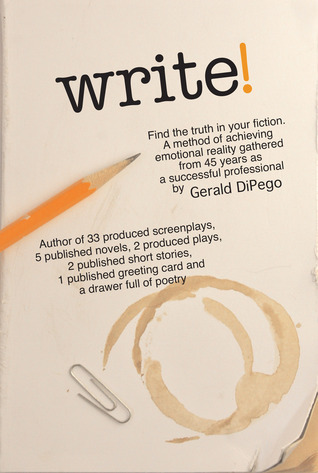 California author Gerald DiPego, born in Chicago has more than thirty screenplays to his name, several novels and plays, and now his first eBook, which is a conversational how-to on creative writing that draws from this long and fruitful career in film and television. Or as the book description reads, ‘WRITE! is a breakthrough book from a successful professional author, for an audience of writers of all levels seeking a guide to the craft. DiPego’s unique personal approach takes readers on a private tour of his well-lighted rooms and dark corners, revealing his way of pulling feeling, experience and invention from within and weaving them into a story. The result of this exciting method is the creation of rich, believable characters and an atmosphere of Emotional Realism. For writers at any stage of advancement (including beginners of course) Gerald’s manner of putting on paper (or computer screen in this instance) is so natural you’ll find yourself mesmerized by how easy he makes it all seem. ALL writers have something to learn form the uncanny way Gerald gets right to the point on every topic of writing he addresses. Imagine honesty and guidance of this quality in an EBook. No matter the degree of experience or sophistication, every writer will benefit from Gerald’s experience and wisdom. 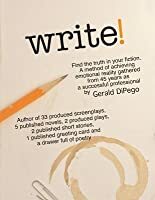 It’s a rare treat to have someone of Gerald Di Pego’s talent and success put together a non-threatening, easy to understand manual for aspiring writers and anyone looking to step up their game. What he reveals about his approach to writing – the cultivation of ideas, addressing the beginning-middle-end, and developing his characters so that they live and breathe – takes the fear out of putting thoughts and words together so they become a cohesive portrait that will grab your audience. Using some It’s a rare treat to have someone of Gerald Di Pego’s talent and success put together a non-threatening, easy to understand manual for aspiring writers and anyone looking to step up their game. What he reveals about his approach to writing – the cultivation of ideas, addressing the beginning-middle-end, and developing his characters so that they live and breathe – takes the fear out of putting thoughts and words together so they become a cohesive portrait that will grab your audience.